Roberto Ramirez (Carlos Gardel) is a gambler who meets Alina (Imperio Argentina) and takes the decision to change his life. 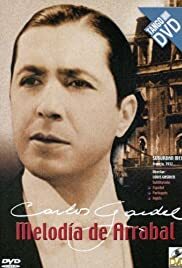 Paramount Argentina mounted a few small scale musicals around the now legendary "Caruso of Tango" Carlos Gardel. Most of these were made by Hollywood directors working apparently at the Astoria New York Studios and resembled the contemporary vehicles for studio contract artists like Bing Crosby. This one has a few prestige elements, like top billed Imperio Argentia and camera work by the great Harry Stradling (Kermesse Heroique, Streetcar Named Desire) no less, though this looks muddy in a poor transfer. The opening plays in the seedy Cafe Lo Estrelea, where the drinkers are about to fight over the flamenco dancer (who we could have seen more of) or shoot it out in crooked car games, while outside armed plain clothes men wait to close in on the wanted "rascal." This intrigues and is a match for French films like COEUR DE LILAS or PEPE LE MOKO or even an indicator of CASABLANCA. Gardel's "Barrio, Barrio" song, which gets the attention of passing music teacher Argentina, meshes nicely. Unfortunately the rest of the film is solid gangland vs. concert hall cliché - " I trust you hands more than I trust your throat" our hero's gambler partner suggests. Miss Argentina, in a few becoming outfits, gets to beam a lot and sing but most of the action is conducted by middle aged men in suits. The short lived Senor Gardel makes little impression. The GLD copy has excellent English sub-titles.